The rising popularity of the Paleo Diet along with its various health benefits have caused quite a stir in the health community. At its core is the assumption that, since our genetic makeup has changed very little – less than 0.02% in the last 40 thousand years – our bodies must still need to get the same food types and the same amount of nutrition as our prehistoric ancestors. However, as many as there are rave reviews about the Paleo diet, there have been doubts about it too. Therefore, this article is meant to help shed light on those questions that you may have about the Paleo diet. Why Is It Called The “Paleo Diet”? Much like other popular diets, e.g. the Atkins and South Beach diets, the Paleo diet will help you lose weight and at the same time live a healthier lifestyle by significantly reducing carbohydrate intake while eating more protein. However, unlike those “other” popular diets, the Paleo diet is able to achieve such benefits through completely natural methods. Forty thousand years ago, the term “fast food” did not exist. People didn’t have white sugar, corn syrup, bread, cakes or any of the more popular carbohydrate sources that we have today. As such, supporters of the Paleo diet believe that in order to have the more robust and fit bodies of our paleolithic ancestors, we must remove these “processed” food items from our diet as well. 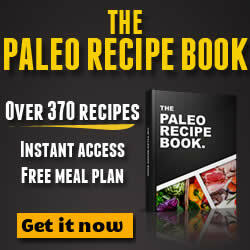 The Paleo diet is patterned after the feeding habits of our hunter-gatherer ancestors, who merely gathered fruits and vegetables, and hunted wild, grass-fed animals as their sole source of food. The list of food items included, represents the diet of the people who lived during the Paleolithic Era, hence the name “Paleo diet” which is also known as the “caveman diet”. The benefits of the caveman diet have only recently emerged, especially with the growing evidence gathered from modern research studies. Scientists further confirmed that our paleolithic ancestors truly had body fat, aerobic fitness, insulin metabolism, blood cholesterol, and blood pressure levels that were far superior to modern day humans2. Because of the limited types of food available to them, cave dwellers naturally consumed less carbs and more protein, and just like all “low carb-high protein” diets, you will naturally find yourself losing weight because of the greater metabolism rate required to digest protein and you will also find yourself feeling less hungry. Finally, the best thing about the caveman diet and perhaps the reason behind its apparent success is because Paleo diet experts do not explicitly discourage eating carbohydrates, and that you no longer have to stress yourself with computing all the calories you consume. With the Paleo Diet, you can actually eat as much as you like, and as long as most of the food you eat is completely natural (unprocessed food), you have NOTHING to worry about. Also, you may be interested in a reading a post I wrote where I provided a concise version of the Paleo Diet Guidelines.